It can be easy to neglect your oral hygiene habits when traveling; after all, you’re away from home and out of your normal routine. 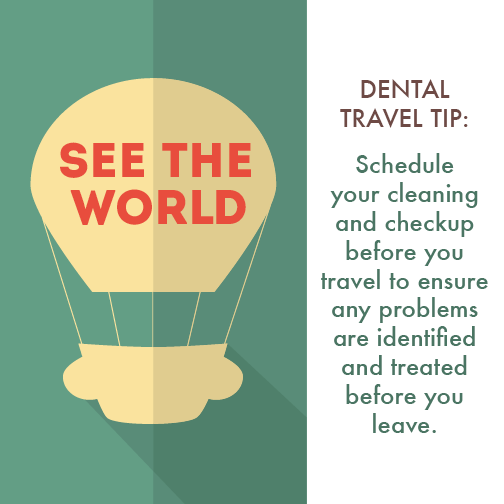 With a little advance planning, you can avoid taking a vacation from your dental health during your holiday travels! 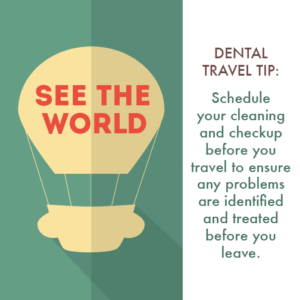 Schedule your cleaning and checkup with your dentist in Shawnee prior to planned travel to ensure any problems are identified and treated before you leave. Call us at (913) 422-0875 to book your appointment. Remember to pack your toothbrush, floss, and mouthwash. If you wear a night guard, pack that too! Use a protective cover for your toothbrush that has holes for ventilation. If traveling by air, keep your toothbrush and floss handy in your personal item for easy access during the flight. During long flights, drink plenty of water, avoid sticky snacks, and chew sugar-free gum. When you arrive at your destination, take your toothbrush out of its cover – a wet toothbrush can breed bacteria. Allow your toothbrush to dry thoroughly before covering it again. If the water isn’t safe to drink where you’re vacationing, it’s not safe for brushing either! Use bottled water instead. Avoid chewing ice, hard candies, or other foods that could chip or crack your teeth. Pack an over-the-counter pain medicine, such as ibuprofen, in case of a toothache. Double-check your dental insurance to be aware of what’s covered while traveling in other states. When traveling abroad, it’s especially important to find a trusted professional if you need emergency dental care. Many countries have dental associations that can refer you to a dentist locally, if needed. If you have a travel insurance policy, contact the insurance company to find a qualified dentist near you. If you experience severe tooth pain or trauma while traveling, feel free to call our office at (913) 422-0875 to discuss your symptoms. We can help you determine if it’s urgent to see a dentist right away or if you can wait until you return home to seek treatment. The entire team here at Dervin Dental wishes you safe and festive travels this holiday season!